Produktinformationen "MARVEL UNIVERSE VARIANT PLAY ARTS KAI X-23 ACTIONFIGUR"
From Square Enix. X-23, the female genetic clone of Wolverine, who inherited his superhuman senses, reflexes, agility, animalistic nature, and healing factor is now available as a Play Arts -Kai-figure! Dynamic use of gloss and matte colorations to recreate her armor or the texture of the inner suit, combined with the painted weathering to show subtle wear and tear of battle from the tip of her mask to the dirt on shoes will ensure any pose looks like it's straight out of the comics. With two head sculpts, three pairs of hands with her signature Adamantium claws and detachable tow claws, enable amazingly dynamic poses for this uncanny member of the X-men! Figure includes display stand. 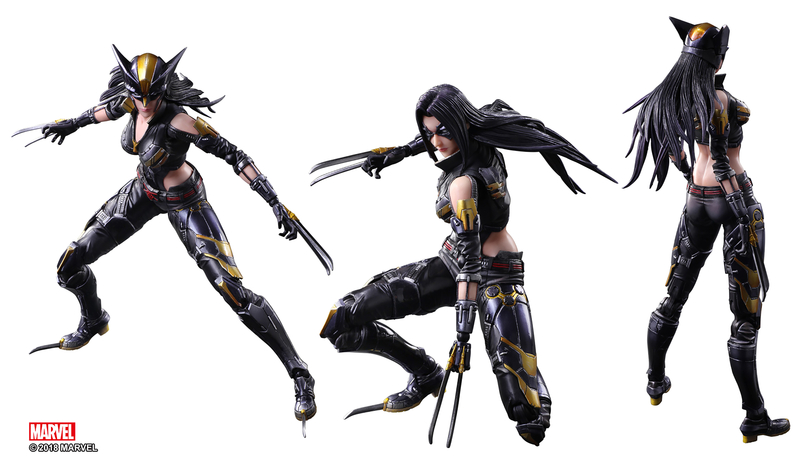 Weiterführende Links zu "MARVEL UNIVERSE VARIANT PLAY ARTS KAI X-23 ACTIONFIGUR"
Kundenbewertungen für "MARVEL UNIVERSE VARIANT PLAY ARTS KAI X-23 ACTIONFIGUR"